Welcome to the final episode of Wildstorm Addiction! 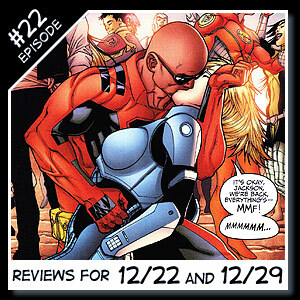 Joe David Soliz and Ben Murphy bring you Wildstorm reviews and news for the weeks of December 22nd and 29th 2010. Reviews including Wildcats #30 and X-files/30 Days of Night #6 (of 6)! 00:00:35 – Joe welcomes everyone to Episode #22 for the weeks of December 22nd and 29th 2010. 00:00:47 – Joe breaks the news that this will likely be our last episode. He also goes over some Wildstorm alumni news. Tim Seeley is doing Antman, Adam Beechen is writing Batman Beyond, and Rebekah Isaacs is creating Magus. Even the official Wildstorm blog, The Bleed, says goodbye with year end notes from Hank Kanalz, Ben Abernathy, and even Jim Lee. Spoiler alerts warning, but all the written Wildstorm reviews at the site are spoiler free unless otherwise noted. 00:03:10 – Ben reviews the final issue of X-files/30 Days of Night #6 (of 6). Written by Steve Niles & Adam Jones with art by Tom Mandrake and cover by Andrea Sorrentino. 00:12:10 – Joe sums up his thoughts on the X-files/30 Days of Night crossover that Steve Niles and Adam Jones gave us. 00:17:08 – Joe reviews Wildcats #30 written by Adam Beechen with art by Mike S. Miller and cover by Jheremy Raapack and Richard Friend. 00:26:39 – Ben can’t come to grips with the end of his youth. He picked up that very first issue of WildC.A.T.S when he was 12 years old and hasn’t stop believing and Grifterizing! 00:28:48 – Ben gives you both the print and digital Wildstorm Releases for the weeks of 12/22 and 12/29. 00:30:33 – Ben and Joe give you their thoughts on the entire year podcasting the end of Wildstorm and what it meant to us. 00:34:55 – The guys invite Chris Striker of The Authority.ws and Clark’s Bar fame onto the podcast and have a final drink in honor of Wildstorm. This audio is un-edited and may have loud popping noises and the content may be PG-13. This entry was posted in Podcast and tagged Chris Striker, podcast, wildcats, X-files/30 Days of Night. Bookmark the permalink.